Ensign: A Full Circle Product Story from Senegal | Rich texture and color is woven into the fabric that creates this product. 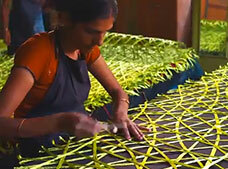 "In this artisan workshop everything is done with care and precision—and with no electricity. Fabric is hand dyed with Azo-free dye. Sewing machines are foot powered and irons are heated by coal. Craftspeople of this unique village have utilized raw skill and an industrious work ethic to preserve the fabric art. From a base palette of 30 vibrant colors, we chose a handful of hues to customize in Varia Ecoresin"
Welcome to Full Circle—a category of sustainable products, a program, a creed and a belief put into action. Senegal: A Full Circle Story | Product development with artisans in Ndem, Senegal.